My three year old granddaughter loves "The Wizard of Oz" and asked for a "Dorfy" cake. I carved the "ruby red slippers" from a frozen Sara Lee pound cake, iced them red and sprinkled them with red sugar. The bows were made from homemade marshmallow fondant tinted red. 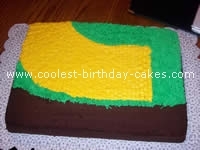 The yellow brick road was freehanded and iced smooth with the "bricks" marked with the edge of a spatula. Green "grass" and poppies complete the top of the cake. I matched the border colors to each section of the cake. Famous quotes from the movie were printed on each side including her favorite "I’ll get you my pretty…" She wore her gingham dress and ruby red slippers for the party and had her hair in pigtails. Her little sister was dressed as a Munchkin from the Lollipop Guild! It was a "wonderful" day! My daughter, Brianna, loves the Wizard of Oz. I’ve baked cakes before but not for something as important as her birthday party. The cake was a store bought cake mix. The icing is also right off the shelf with green food coloring and covered the whole cake. 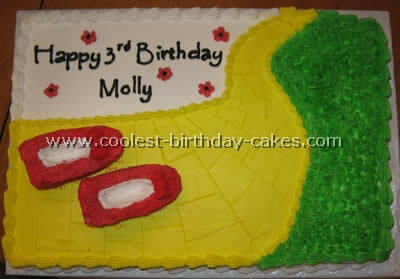 I than added the yellow brick road by just adding yellow icing. The poppies were large daisy candy flowers that were colored red with edible "spray paint" found at a local Michael’s store or you could just pipe them on and dot them with green icing. I found emerald city, the rainbow and Dorothy and friends off the internet and laminated them and found letter candles to print out her name. The Wizard of Oz cake was a great hit with the kids and I’ll be a little more confident when the next party comes up. My daughter is three and loves dressing up like Dorothy from the Wizard of Oz. so of course we made a Dorothy cake. I used the doll cake mold. I bought the Dorothy Barbie just for the dress. I bought an in expensive Barbie and popped her legs off to make her look like she was sitting down. (She was too tall if she was standing). I put the dress on her and down she went. I kept it simple by just doing stars all around for the gingham print of her dress. My daughter was very happy. 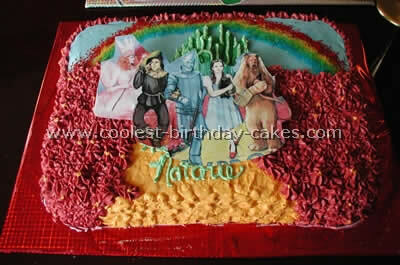 This Wizard of Oz cake is a rather large cake with a few different parts of cake on the base. My friend’s mother in-law loves the Wizard of Oz. I could not find a cake anywhere so after reviewing the movie a couple of times I choose a scene for her birthday cake. For the base I used a 14×2 cake pan. For all the cakes I used a box store brand, any brand will do and the same with the frosting. 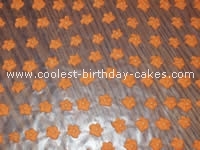 In order to get the different colors I used frosting dye that you can buy at the party craft or cake stores. 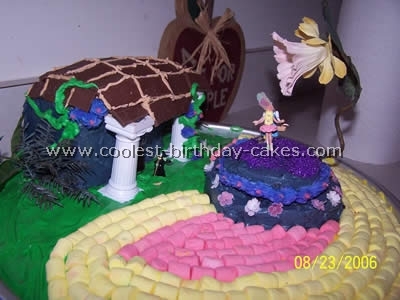 For the yellow brick road and pink I used mini marshmallows that come in different colors which you can get in the food store for like 99 cents. The house was made out of a house shaped cake pan. I cut off the roof because it wasn’t the right style. I also cut the house a bit smaller. Then cut a corner of the house just a bit so it leans into the base. Ice the house then put it on the base. The roof and stuff can be added afterwards .I used chocolate bars for the roof. I traced along the bars with icing to make an out line. The smaller platform was cut out of the leftovers from the house. I used little figures I had found in a store. The large flower over the figures I got at a craft store. 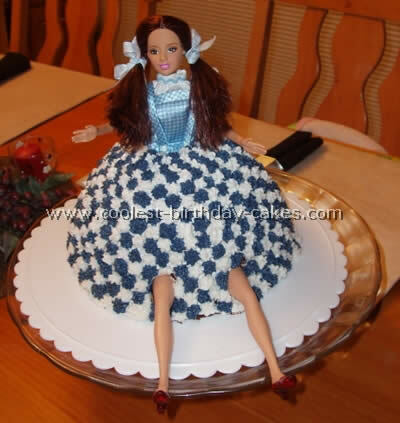 This Wizard of Oz cake looks really hard but once you get going it’s really not that bad. It took me a day to do this with many breaks but if you did it none stop a few hours. 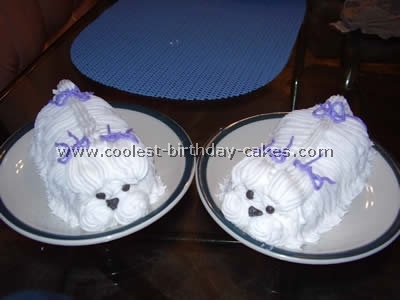 Bake your cakes the night before, this way all you have to do is ice and decorate. The house doesn’t have to look perfect; after all it did fall out of the sky. 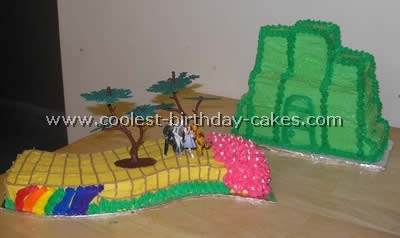 This wizard of oz cake was easy to do. I used blue icing for the background. Emerald castle was two color greens, rainbow was different colored sugar, yellow brick road was basic tip 5 and the poppies were also just a basic tip with yellow in middle. I cheated with the characters by a photo copy. My niece loved it just the same and a cake with little skill need. I made this Wizard of Oz cake for my daughter Annie’s 8th birthday party. Wizard of Oz party stuff is hard to find. I had to be very creative. After trying to find figures for my cake I gave up and found some cardstock stickers with the characters. I put them on skewers and decided that would have to do. I made a lot of orange poppies out of royal icing. I baked my cake and frosted it with a yellow brick road and lots of green grass. I added the poppies and the figures and the writing and it was done. A pretty cute cake and really easy! We had a great Wizard of Oz party! 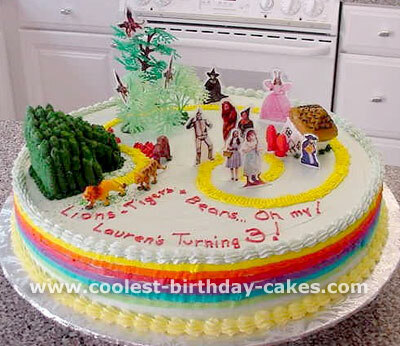 This Wizard of Oz cake is a fun one. I have to say that if I did it again, it would probably be even better but I thought it might give others a neat idea to work with. I used Wilton Manors butter cream boxed icing for both cakes. First I baked three cakes in a 15 x 12 inch cake pan. The Emerald city is many layers of different size rectangles and squares with wooden sticks through them to keep them from falling. After icing with the lighter green I used white cake sparkles to give it a magical feel. Then I piped with darker green. 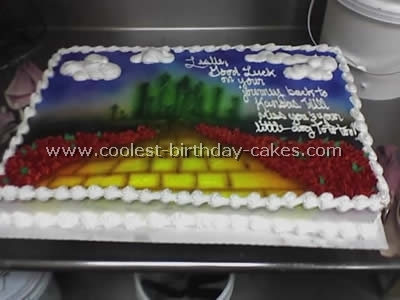 The yellow brick road is cut from one of the large cakes. It was iced with yellow first and then piped with brown for the bricks. The rainbow (which doesn’t look as good as it should but I think it was about 4:00 AM at that point!) was done next. The poppies were piped with a flower tip. The characters were just a print out I found online taped to a popsicle stick and the trees are from my kids’ collection of animal sets. 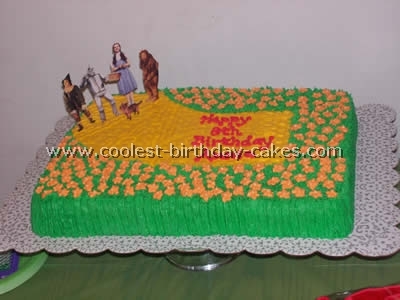 My godson really loved this Wizard of Oz cake! One of the girls from work was moving back to her home state of Kansas, and so we decided to throw her a Wizard of Oz going away party. This cake is a full sheet cake iced in buttercream. 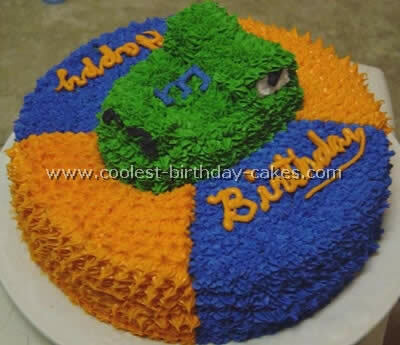 It has been airbrushed and has 3-dimensional touches of buttercream to give it it’s look. 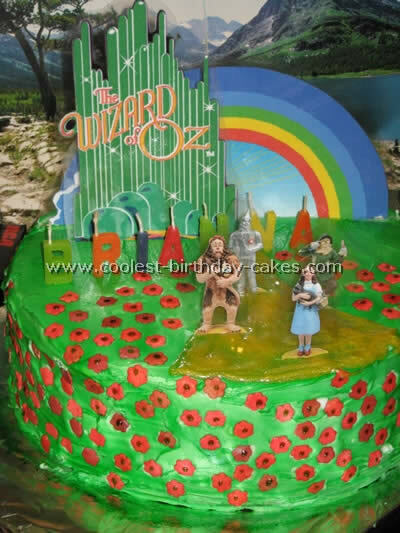 The emerald city was airbrushed while the poppy lined yellow brick road was made of buttercream. I made this Wizard of Oz cake for a lady whose daughter just loved the Wizard of Oz. I put the rainbow around the sides of the 14" round cake. The top was iced in a pale green. Near the middle is Munchkin Land . You can see small figures of Dorothy, the Lion, The Tin Man and the Scarecrow as well as the Coroner standing next to the "landed house" (notice the small legs and red slippers under the house?) If you look close, you will see there is an additional figure with the regular characters. The birthday girl came over to my house the week before her birthday all dressed up as Dorothy with her stuffed dog and basket and little blue dress. 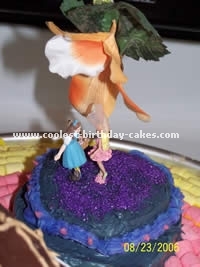 I took a photo of her and added her to the Wizard of Oz cake along with the other characters. When she saw herself in Munchkin Land standing next to her favorite characters, she was ecstatic! The Landed house was just a cube of cake with the bottom cut off and a roof attached. I used Barbie doll shoes for the ruby slippers with piping gel and sugar crystals on them to make them glisten. The legs are just black and white butter cream. The yellow brick road (yellow butter cream) goes around Munchkin Land and passes the good witch in a pink gown as it leads into the forest. I used plastic trees and attached pictures of those nasty flying monkeys to the treetops. Finally, the yellow brick road leads to Emerald City . That was a chunk of cake iced in green butter cream with peaks piped on top and green sprinkles to make it glitter a bit (doesn’t show well in the photo). I had a bit of trouble creating Emerald City , but I think they got the idea. I added a plastic lion, tiger and bear in front of Emerald City . The character and birthday girl pics were made from printed photos from the Internet (and the girl was of herself). I laminated them between plastic and cut them out close to the borders and just stuck them into the Wizard of Oz cake so no ink touched the cake or icing.